A Christian who knows when to pray the right kind of prayer joins forces with God and gets answers every time. Learn the ways different kinds of prayer work together to get results. 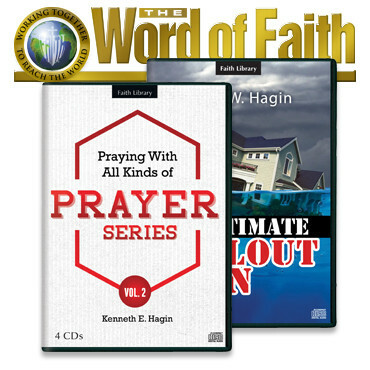 • Praying With All Kinds of Prayer—Volume 2, a 4-CD series by Kenneth E. Hagin. Stop the wasted motion of praying without getting results. Find out how the Bible teaches us to pray the prayers of care-casting and praise and worship, and learn the power of corporate prayer. • The Ultimate Bailout Plan, a 2-CD set by Craig W. Hagin. Trusting in the Lord with all your heart involves not worrying about a situation. Be encouraged to keep your faith in God no matter what obstacles you face.